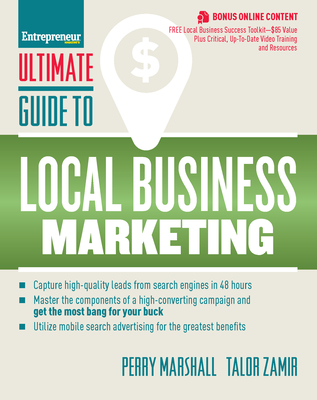 With Google, Yahoo , and Bing returning local businesses as results on more than a billion daily searches, Google Adwords expert Perry Marshall and lead generation expert Talor Zamir introduce you to the basic framework behind a successful local SEO campaign. Perry Marshall is the number-one author and world's most-quoted consultant on Google advertising. He has helped over 100,000 advertisers save billions of dollars in "AdWords stupidity tax." His Chicago company, Perry S. Marshall and Associates, consults both online and brick-and-mortar companies on generating sales leads, web traffic, and maximizing advertising results. Marshall has been featured at conferences in the U.S., Canada, Ireland, Great Britain, Israel and Australia. He's shared the stage with Zig Ziglar, Brian Tracy, Jay Abraham, Gary Halbert, Harvey Mackay and Les Brown. He's consulted in over 200 industries, from computer hardware and software to high-end consulting, from health and fitness to corporate finance. Marshall lives in Chicago, IL.Talor Zamir is a highly-sought after speaker and consultant in the fields of internet marketing, entrepreneurship, and personal development. He has generated tens of thousands of leads for local businesses via his "Local Business Landing Page Template" and unique PPC strategies. Zamir lives in Las Vegas, NV.